The 091-263-12-1500, Inverter-Charger, 1500-12, uses 12 volt battery power to produce pure sine wave 120V power in mobile applications, and recharges vehicle batteries when an external AC source is available. The circuitry and construction are field-proven to provide reliable power in harsh environments and in rugged mobile and industrial applications. Work with Super Auto Eject with Deluxe Covers. 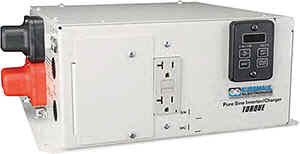 Input Current: Up to 150 Amps DC Cont.